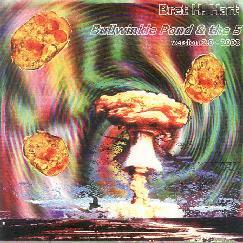 Bret Hart: Bullwinkle Pond & The 5 - "12 Layered Improvisations for Meditation" / Bret Hart: Bullwinkle Pond & The 5 - "Version 2.0 - 2003"
I've heard quite a lot of Bret Hart's music over the past few years, but one of the standouts for me was the reissue of his 1989 Bullwinkle Pond & The 5 album (see AI #19), with it's John Fahey styled take on traditional American music, along with plenty of the avant-garde free-improv that Bret excels at. 12 Layered Improvisations for Meditation is yet another reissue of this fine album (different cover and title) originally recorded while Bret was stationed in Korea, and with fresh ears I revisit this lively set of everything from homage-to-Fahey workouts to beautiful dissonance, all done on acoustic guitar. The recording quality is very good so we get to fine tune our ears into all the details of Bret's string attacks and manipulation techniques. 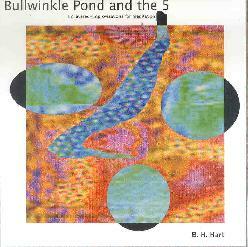 Fans of the modern, and more purist, proponents of the Fahey/Kottke sound like Steffan Basho-Junghans and Harris Newman would do well to check out the Bullwinkle Pond & The 5 recordings for a fresh, adventurous and passionate interpretation of this style of guitar. You'll be enticed by sounds you're familiar with, but then dragged into the avant-garde abyss by far more twisted ear candy that is still - in my opinion - highly accessible, though far more challenging to the listener who may not be expecting what Bret throws at them. Great stuff! I have long considered my record Bullwinkle Pond & The 5 a favorite. It has called me back for a listen many times during the intervening 15 years since its release. Working entirely from memory of the twelve 1988 compositions, I created new arrangements and digitally re-recorded them. So it made sense to do a back-to-back writeup in the same spirit that Bret recorded the new album. Now the last thing I was interested in while listening to this new version was analyzing the contrasts and comparisons with the original. I just gave it a fresh listen and let the music take me where it would. But one thing that struck me right out of the starting gate was that the Fahey influenced tracks have a much more overt Blues feel. The other prominent difference is that Bret includes electric guitar on this outing, which Rocks things up quite a bit. Also, the more avant-garde oriented tracks are noticeably more... it's tough to articulate... I'll say assertive and confident. Not surprising given the 15 additional years of playing and experience. Hell, there's even a couple of atmospheric King Crimson sounding bits. I think the two discs make a striking pair. The new version ultimately retains the spirit of the original while traveling in a somewhat different realm.